*Configured for Netscape Navigator 2.0 - If you are using another WWW browser read this first. 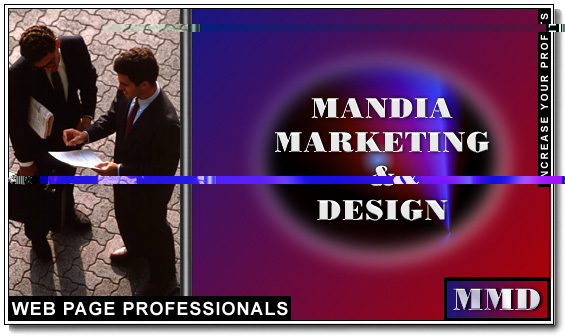 Mandia Marketing & Design (MMD) is a creative advertising company that will help you to reach millions of potential customers through advertising on the Internet World Wide Web (WWW). Through the use of professional graphic design software applications, we can make your presence on the Web come alive. The image below will be displayed at the top of every page. This button bar is clickable and should be used to help you navigate the various MMD Web pages. A description of each button is listed below and may also be clicked on to move to another informative Web page. ABOUT - Information about the company and its mission. FACTS - Research facts showing the explosive potential of Internet advertising. PORTFOLIO - Dedicated to showing you our clients' home pages. SERVICES - A description of the services that MMD offers and the fees involved. EXAMPLES - A few examples of MMD's page-enhancing techniques. QUESTIONS - A form for you to fill out so we may answer your questions. Please take your time and click on each button. Most of the pages you will see here are simple in design so as to keep the load time to a minimum. You will see some very complex graphics on the Examples Page and also when visiting some of the Web sites we have authored for our clients. Thank you for considering MMD for your Internet advertising needs. We will be happy to answer your questions at any time.